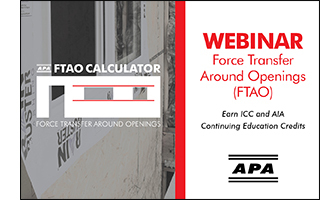 Watch an easy overview of APA – The Engineered Wood Association’s free design tool, the FTAO Calculator, in this free, 60-minute recorded webinar, Shear Wall Analysis Made Easy: Force Transfer Around Openings Calculator. APA field engineer Alese Ashuckian, P.E., LEED AP, guides viewers through the design implementation of FTAO shear walls with a focus on asymmetric piers and multiple openings. Design examples are also discussed throughout the presentation. Wood structural panel sheathed shear walls and diaphragms are the primary lateral-load-resisting elements in wood-frame construction. As wood-frame construction continues to evolve, designers in many parts of the U.S. are optimizing solutions that require the understanding of force transfer between elements in the lateral load-resisting system. The free webinar, Shear Wall Analysis Made Easy: Force Transfer Around Openings Calculator, is now available on the APA website at www.apawood.org/shear-wall-analysis. Questions and answers from the live presentation of the webinar are also available on the APA website. The course has been approved by AIA and ICC for 1 HSW/LU and 0.10 CEU, respectively.